Helen's singing career began as a 14 year old schoolgirl in London. Indeed, fitting her schoolwork into her busy musical schedule was a problem for the young singer whose voice, despite her tender age, was being compared by some people to that of well known opera singers. She had ambitions even at this early stage in her career to be a 'jazz singer' and idolised people like Frank Sinatra and Judy Garland, hardly performers who were particularly followed by teenagers in the early sixties. The obvious richness and power of her voice led to a recording contract with Columbia EMI where she was placed under the guidance and arrangements of Norrie Paramor. Although her early singles still show testimony to her splendid voice, the dreadful 'girlie' backings now make the records sound extremely dated. It is a great pity that Paramor could not exploit Helen's young voice to produce something of more lasting value. Although one or two of her recordings from the late 1960s were picked up by enthusiasts of 'northern soul' and have become quite valuable most of her singles from the Paramor era are collectable but not highly prized. The EP shown on the left (SEG8128) shows Helen in what is presumably, a rather petulant 'Don't Treat Me Like A Child' pose. However, the contents do not come from any of her hits despite the fact that this was her debut on this format. Instead, we find a very young Helen providing us with a perhaps slightly naive foretaste of what is to come from her in the years beyond her pop stardom. The disc finds her in the company of the Martin Slavin Orchestra instead of Norrie Paramor. They provide a splendid jazzy backing for what Helen describes herself as "swinging standards". In any event, the decision makers at EMI obviously had doubts about Helen's mood on this picture sleeve. Later copies of the same EP find her in a different pose- with a beaming smile. Fortunately, both versions are quite easy to find and are well worth a listen. As her pop music career faded she undertook every opportunity to establish herself as a blues artist. Her wonderful voice has lost none of its power over the years and after producing her first independent jazz album; 'Straighten Up and Fly Right' in 1983, she went on to collaborate with a number of respected British jazz musicians. The best known of these is Humphrey Lyttelton with whom she was associated for 17 years- until 2001. During 1987 Helen became a Christian and has subsequently become an enthusiastic singer of Gospel music, and this is increasingly the focus of her output. 2002 will apparently be the last season in which she intends her concert appearances to include a mixture of jazz, gospel and her original pop songs. I am not used to recommending 're-issued' material in any form in preference to original 45s, and seldom do re-recordings do justice to hits. 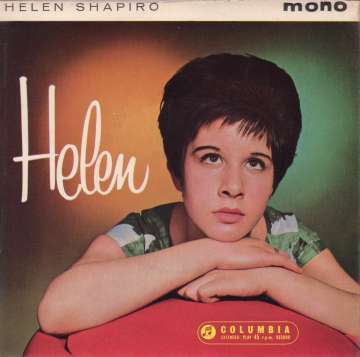 However Helen Shapiro's recorded output in recent years has been prolific. These include newly recorded versions of most of the songs in the discography below. All her current music is worth seeking out, be it jazz, gospel or her old pop songs- which no longer have the girlie backings!